Eight cities across the country are getting set to host the first two rounds of the NCAA Tournament this weekend. Only two of them lie further west than the central time zone: San Jose, CA and Salt Lake City, UT. Both of those locations are more than 2,000 miles away from Syracuse, but because of the Orange’s ACC affiliation and the committee’s desire to keep them from playing a conference opponent in the round of 32, SU is making the trek to SLC to take on Baylor in the first round on Thursday. Funny enough, this actually won’t be the first time that the Orange try their hand in the NCAA Tournament in Salt Lake City. Top-seeded Syracuse fell to No. 3 Butler 63-59 in the 2010 Sweet Sixteen in Salt Lake City. But don’t fear, Fizz Nation, this isn’t some kind of west coast curse for SU. In fact, since that stumble in 2010, the Orange have been unstoppable west of the central time zone with a perfect 6-0 record. On one of the extremely rare occasions in which Syracuse played a regular season game on the west coast, the Orange took a trip to San Diego on Nov. 11, 2012 to take on the San Diego State Aztecs in the season opener. But this trip wasn’t to play at SDSU’s Viejas Arena. Instead, SU and SDSU loaded onto the USS Midway and squared off on the deck of the retired aircraft carrier on Veterans’ Day. No. 9 Syracuse held off a late push from the No. 20 Aztecs to take a relatively comfortable 62-49 win in the season opener behind 17 points from both C.J. Fair and Michael Carter-Williams and 15 from Brandon Triche. This game was certainly one of the most unique in the history of Syracuse basketball and it also kickstarted the Orange’s dominant stretch on the west coast. Just four months after its impressive performance in San Diego, SU returned to The Golden State, but this time went some 460 miles north to San Jose for the opening weekend of the NCAA Tournament. The third-seeded Orange took on 14-seed Montana in the first round and it was not pretty for the Grizzlies. SU led from wire-to-wire and annihilated Montana 81-34 in one of the most impressive defensive performances in program history. The Orange held the Grizzlies to just 20% shooting with no Montana player scoring more than 5 points. Brandon Triche led the way offensively with 20 points. The round of 32 was not quite the same cake walk for SU, but a diverse scoring attack led the Orange to the Sweet 16 with a 66-60 win over 12th-seeded Cal. C.J. Fair (18), James Southerland (14), Michael Carter-Williams (12) and Baye Moussa Keita (11) all scored in double figures for SU in a game that saw Syracuse shoot just 63% from the free-throw line (sound familiar?). The Orange went on to win two more games against Marquette and Indiana in Washington, D.C. before falling to Michigan in the Final Four in Atlanta. It was a relatively unlikely tournament run for the Orange to make it all the way to the ATL, knocking off the top-seeded Hoosiers in the process, but it all started on the west coast. Can the Orange pull of something even more impressive with a similar starting destination in 2019? Boy, Syracuse really knows how to bunch their west coast games together, don’t they? In a span of just 12 months from November 2012 to November 2013, SU made trips to San Diego, San Jose and then Maui, Hawaii. After barely squeaking past St. Francis Brooklyn in the mainland portion of the invitational at the Carrier Dome, SU rolled past Minnesota 75-67 in the first game of the invitational at Lahaina Civic Center. C.J. Fair got his senior year off to a great start with a team-high 16 points. The very next night saw a rematch from March’s NCAA Tournament against the Cal Golden Bears and just like the spring edition, SU secured a win over Cal on the west coast, albeit in much more highly scoring fashion, 92-81. Freshman point guard Tyler Ennis staged his coming-out party with a game-high 28 points on 9-12 shooting to go along with four assists and four rebounds. 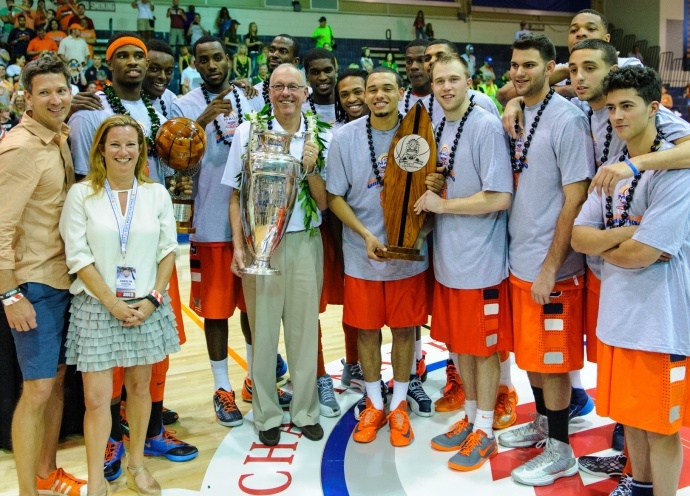 Then came the Maui title game and how about this. The same team that SU is taking on in Salt Lake City on Thursday is the exact same squad that the Orange played in its last west coast game in 2013. No. 8 Syracuse took down No. 18 Baylor 74-67 behind a 24-point performance from C.J. Fair who picked up MVP honors after averaging 18 points and 6.3 rebounds per game. Since that warm November night in 2013, the closest Syracuse has come to the mountain, pacific or Hawaiian time zone was Omaha, NE for its Sweet 16 run a year ago. It almost seems like the further west Syracuse goes, the better they play. Even if it is just a coincidence, that can only be a good omen for the Orange in Salt Lake City this weekend.